Adapted for inclusion in Chapter Eight of Conscience of a Progressive. Since there is no such entity as “the public” – since the public is merely a number of individuals – any claimed or implied conflict of the “public interest” with private interests means that the interests of some men must be sacrificed to the interests of and wishes of others. A society is a cooperative venture for mutual advantage... Social cooperation makes possible a better life for all than any would have if each were to live solely by his own efforts. You think? Ask the survivors of the New Orleans Super Dome and convention center. Who is better equipped to prepare for natural disasters and, when they strike, to deal with them? Individual citizens acting on their own, or government agencies acting in behalf of the community at large – acting professionally, with expert information, and with clear command and coordination? Again, for your answer, consider New Orleans. It comes down to this simple question: Is there such a thing as a “public interest” distinct and apart from a simple summation of private interests? The libertarians and the regressive right say that there is not. Progressives say that there is a public interest, and both history and common sense bear this out. In a free society, the appropriate protector and administrator of this public interest is a government of, by, and for the people. Our founding documents affirm this explicitly. The regressive right (falsely called “conservatives”) tells us otherwise. Thus we are now experiencing the bitter consequences of Ronald Reagan’s 1981 inauguration pronouncement: “government is not the solution, government is the problem.” The Reagan administration and the two subsequent Bush administrations have crippled and dismantled government agencies almost the point at which, as Grover Norquist puts it, government can be “drowned in a bathtub.” And so today it is the unprepared and unprotected city of New Orleans that is drowning in the filthy flood waters left by Hurricane Katrina. "Now hold on!," the libertarian retorts, "the residents of New Orleans are ultimately at fault, because they chose to live in a sub-sea-level bowl. Progressives see things very differently. They regard New Orleans and the Gulf region as vital organs of the body politic and of the economy of the United States. Thus damage to this regional part is damage to the entire nation. Imagine that two communities are situated on opposite sides of a great river. On the right bank (appropriately) is “Randville,” populated by libertarians – rugged individualists who are contemptuous of “collective” activity and who assume full personal responsibility for their personal safety, welfare and property. On the left bank is “Rawlsburg,” comprised of individuals who, while covetous of their personal rights, fully acknowledge the existence of public interests. They are therefore aware of the desirability of acting collectively, in the words of the Preamble to the US Constitution, “to insure domestic tranquility, provide for the common defense, [and] promote the general Welfare." News arrives at both communities from (gulp!) a government bureau, that a great flood is approaching from upstream. The citizens of Randville immediately get to work piling sandbags around each of their individual dwellings. Across the river in Rawlsburg, brigades of citizens are hard at work building a levee around the entire town. Come the flood, the puny separate efforts of the rugged Randville individualists prove to be futile, while the substantial communal levee surrounding Rawlsburg holds firm and the community is spared. Very well, but what about those Randvillians who say: “you guys go right ahead and build that levee. I’d rather stay at home – I have other priorities.” Surely the good libertarians wouldn’t want to force anyone to contribute to the common defense! And so we have the well-known “free rider problem,” whereby an individual gains unearned and cost-free advantage from the labor of others. A profound injustice on the face of it. The solution? What else than to coerce a contribution to the common effort, either by labor or, failing that, cash assessments. So it comes to this: The only way for the Randvillians to deal with “the free riders” is to coerce labor on the levees, or assess taxes in lieu of labor. They must do so in behalf (are you ready for this?) of the “common good” of the community-as-a-whole. Just as the Rawlsburgers are doing across the river. Consider another case: this one is not fanciful – it is quite real. In April, 2003, California Governor Gray Davis requested $430 million in federal funds to reduce the fire hazard in the southern California forests. The request was ignored until, October 24, George Bush rejected it. A few hours later, “the Old Fire” broke out in the San Bernardino mountains, followed by several more fires, eventually consuming three quarter of a million acres and 3577 homes, and causing 22 fatalities. This particular disaster struck close to home – precisely 150 feet close to my home, where the fire was stopped at my property line. “The Old Fire” almost surrounded the cluster of houses in our neighborhood, and only the combined, coordinated and professional effort of the US forest Service and the state and local firefighters saved our homes. Several days earlier we were ordered off the mountain while these “big government bureaucracies” did their work – magnificently. (See my “If It Burns, It Earns”). All of us San Bernardino mountaineers – democrats, republican, independents – were convinced, contrary to George Bush, that “the government” spent our money better than we could. One final example: Had the December, 2004 tsunami occurred in the Pacific Ocean instead of the Indian Ocean, the death toll would have been much lower. This is because there is an international tsunami warning system in place in the Pacific, and following the earthquake that triggered it, populations around the Pacific rim would have had advance warning from several minutes to several hours. (In deep water, tsunami waves travel up to 500 mph, and much slower near shore). Because there is no such system in the Indian Ocean, the December 26 tsunami struck without warning. The role of government in protecting the lives and property of its citizens, one of the sole legitimate functions of government recognized by the libertarians, is universally acknowledged in civilized societies, as it was in the United States until, apparently, January 2001. No longer. 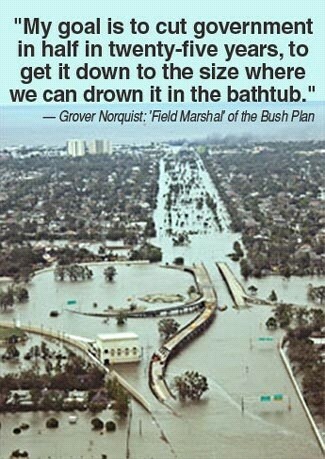 The policy of the Bush government is to cut the FEMA funds and put a political hack in charge, send the National Guard to Iraq, and slash the funding for the New Orleans levees. And if you don’t like it, private citizen, here’s a shovel and a sand bag, now get to work! Well that’s just fine if you happen to be one of the fortunate 1% who has “invested” in the GOP and Bush campaign juggernaut, and are thus the beneficiary of Bush’s tax cuts and deregulation. If not, then you are out in the cold – or if you are poor and in New Orleans, stuck in the toxic soup. So why did Michael Brown, the former horse-trader and present Administrator of the Federal Emergency Management Agency, allow FEMA to fail so spectacularly? Simply because he was not appointed to manage emergencies. He was appointed to dismantle the Agency – one of many Busheviks selected to “starve the beast” of government bureaucracy. Michael Brown, Homeland Security Secretary Michael Chertoff, and their sort fail to function as public servants because, as true Randvillians, they believe that “there is no such entity as ‘the public.’” There are only individuals responsible for their own personal welfare. And so, when the storm approaches, the sole responsibility of government, they believe, is to tell the citizens to “get out of town, now!” No further thought as to how these individuals are to manage their exit – and so the school buses and the army trucks remain idle as the waters rise. No thought about how those who are trapped in the city are to be fed, sheltered, and protected. That’s their misfortune. Government? It’s “the problem,” not a solution. In contrast, Rawlsburgers, who readily recognize the existence of public goods and public interest, know how to work together in the common interest. In the spirit of our founders and their Declaration, they establish and support an institution, government, to act in behalf of this public, “deriving its just powers from the consent of the governed.” Then they put government agencies in the hands of qualified and dedicated individuals, like Bill Clinton’s brilliant FEMA Administrator James Lee Witt, who anticipate disasters, prevent them whenever possible, and who plan and then implement contingency plans when disaster strikes. When the disaster is imminent and foreseeable, as was the case with Hurricane Katrina, rapid response facilities are assembled close to the affected area, prepared to take action at the earliest opportunity. All this requires personnel, equipment and cash appropriations – personnel and equipment that Bush preferred to deploy in Iraq, and cash that Bush chose instead to give as tax “relief” to his super-wealthy sponsors. Adaptability that is “reality based” – founded upon scientific information and practical experience – is the hallmark of intelligence, and of effective and just governance. But the Busheviks, openly contemptuous of “reality based” policies are immobilized by their Randvillian dogmas and by the dictates of their corporate “stockholders.” Thus they cannot adapt. For proof, look to New Orleans and the Gulf coast. Today, the port of New Orleans is closed, through which our leading exports, agricultural products, flow to offset in small part our gigantic trade deficits. In addition, imports of essential strategic raw materials are blocked and must be re-routed to other ports, ill-prepared to deal with them. This grossly under-reported consequence of Katrina, along with the reduction of Gulf coast petroleum and natural gas production, will have devastating consequences for the U.S. economy. None of this can reasonably be blamed on Al Qaeda or the Clinton Administration – not that Karl Rove and his henchmen in the media won’t try their damndest to do just that. Some very tough economic times are just ahead, and it’s the Busheviks’ worst nightmare, for at last, the public at large may be forced to face up to the enormity of the crimes and mal-administration of Bush, Inc.